Whether you are getting ready for your Father's day Baseball outing or just gathering the kids together for a regular day out, don't forget to wear your All Star Team Personalized T-Shirts! Your Father's Day shirt is Available on our premium white 100% cotton Personalized Shirt, machine washable in adult sizes S-3XL. Father's Day shirt is also available in Ash Gray. Shirt for dad includes FREE Personalization! Personalize your T-shirt with any title and up to 12 names! 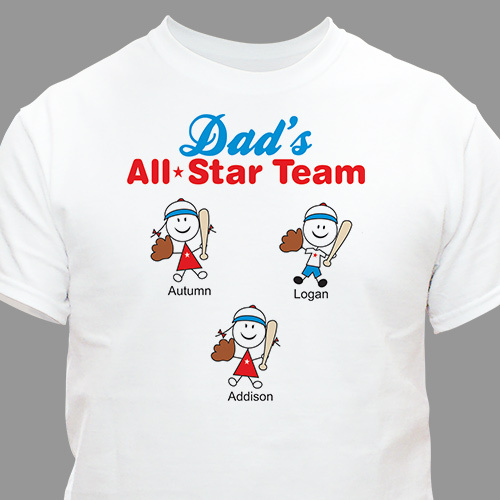 We love baseball and we love our grandchildren, so this shirt was a perfect match. My Son(the Dad) is a sportswriter so he will really get a kick out of this shirt. The personalization was done perfectly and looks great! Get your dad ready this Father's Day with Personalized Hobby and Leisure Gifts! GiftsForYouNow.Com has everything you need to make this years Father's Day special like our Personalized Anybody Can Be A Father T-shirt and our Grill Master Personalized Platter as well!